The Motorola DEFY comes with a custom Gallery app (like the XT720 one) with cool 3D effects, reflections and smooth animations. In terms of eye candy, we have no complaints. The Gallery is split into three sections – Camera roll (shows the most recent photos you’ve snapped), My tags (you tag photos to keep things organized), Folders (combines all folders from the memory that contain photos or videos), All Photos, All Videos and Copy Protected stuff. Viewing a folder (be it the camera roll or another), photos are displayed as one long line of photos (landscape mode) or as a grid of small thumbs (portrait mode). In the 3D landscape view you can scroll sideways to browse the photos and as you do, a label appears that shows when the photo (or video) was taken. From the menu option, you can set a specific point in time and the Gallery will scroll there automatically. The smooth animations sure are eye-catching but a boring grid view is much better for browsing a large collection of photos. Turn the phone on its side and it will switch to grid view. Pinch zooming is also enabled here but you can use double tap too. The Quick upload and Share features offer quick sharing via MOTOBLUR Share (on Facebook, MySpace, Picasa, Photobucket, etc.) and also Email apps, Bluetooth and MMS. One thing still missing in the DEFY Gallery that we would have liked is support for, say, TwitPic or another easy way to send out a tweet with a link to a photo, without having to first upload the photo, manually copy its URL and then write your message. The Music player on the Motorola DEFY takes the same approach as the Messaging app – it puts all the music related things in one place. My Music is the basic music player – it plays songs from your memory card and it can filter tracks by artist, album, playlists and so on. A cool feature automatically pulls album art for the song and – get this – the song lyrics, which are displayed in sync with the song. This turns the DEFY into a mini karaoke (of course, it needs an Internet connection). But there is more – some non-English songs even have English subtitles under the original ones – an awesome feature! A tap on the screen reveals the scrubber. You can send a blip – a quick “Love it” or “Hate it” message on Twitter or Facebook. There is another cool option too – you can see who is listening to your current track and where they are around the globe. The Music Videos section of the Music app offers quick searches on YouTube or GoTV for the music videos (what else?). Community taps into the social networks to find you some new music. There are still some shortcomings of the music player that need addressing though. The equalizer presets are uncomfortably stored deep in the phone’s setting menu, there’s no Cover Flow-like Album Art view, and you can’t set a favorite track from your playlist to repeat several times. The Motorola DEFY did greatly in the first part of our audio quality test. When the handset is connected to an active external amplifier (such as a car or home stereo) it achieved excellent scores and showed no weaknesses whatsoever. And the device is pretty loud too. In this scenario the DEFY can easily rival the best among mobile phones (and even dedicated players). 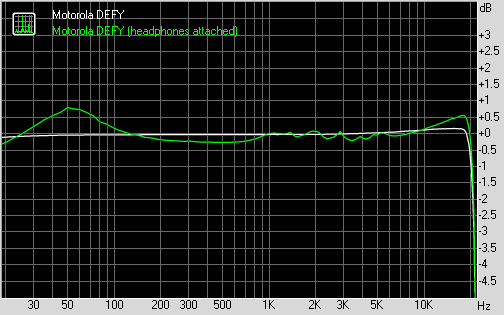 When headphones come into play however there's noticeable degradation, mostly in terms of stereo crosstalk. Frequency response worsens a bit too, but it's still not too big a deal. The final components of the DEFY performance to lose some ground here are the inter-modulation distortion (which increases to average) and loudness (which drops from excellent to just good). Overall, we would say that the DEFY did a very solid job, but audiophiles might still have a few better options.